Need Good Driveway Repair In Dallas? Contractors Stop Crack Damage. Use Our Process. Get driveway repair in Dallas done by outstanding contractors — contact HD. If cracks are harming your driveway, our company can help. We perform estimates at no charge and use a procedure that’s effective. In the event you’re a property owner in the Dallas area, contact the driveway repair contractors that can help. We’re the best at terminating fractures and other forms of concrete damage. Due to the climate in North Texas, driveways issues are common. 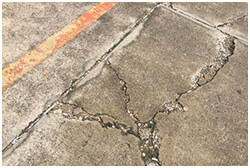 Hot and cold temperatures affect concrete driveways and produce cracks. With an average high temperature of 96 degrees in the DFW area in summer, and a low of 57 degrees in winter, fractures commonly occur in all types of surfaces. 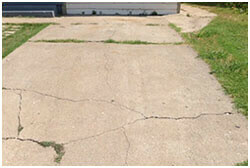 To stop crack damage, Dallas contractors use a driveway repair process thats highly effective. Driveways can also be harmed by water. While average rainfall in the area is approximately 37.7 “ annually, in 2015 the area had over 16.90” of moisture due to flooding in a one-month period alone. When water enters driveway fractures, it weakens the concrete and creates upheaval and chipping. If you have driveway issues like this, get help from a company that offers apartment, commercial and residential services. We’re driveway contractors in Dallas that fix driveway cracks, pave driveways, resurface them, and pour new ones. HD will make your damaged surface level again. If your driveway becomes uneven or you notice cracking or pitting that needs repair, give us a call. In order to fix your driveway, we use various methods to halt cracks. One repair process we use involves removing particular areas of your driveway by cutting them out and replacing the broken surfaces with fresh, new panels. We’re Dallas contractors that believe is using a specific method of driveway repair on crack damage. We do this by creating an effective mix that’s a minimum of 4,000 psi. We install control joints in driveways to prevent cracking, and pour residential driveways that are 3-1/2 – 4” thick. Commercial driveways repairs are done using 5-1/2”- 6” thick sections of concrete. Sometimes we stop damaging cracks by lifting the driveway up to make it level and even. You’ll want to find out more and make sure that you enlist a driveway repair company that’s good. We’re a Dallas team with an outstanding Better Business Bureau (BBB) rating. We provide excellent service in Plano, Fort Worth, Irving, Arlington and other DFW cities. Property owners frequently need driveway service because their driveway is sinking. Sloping may become a big concern. In this case, the contractors at HD may opt to use a driveway repair method that requires filling any voids under the concrete surface. We do this by creating 1-1/2” holes in the driveway and then pumping concrete into the opening. It’s possible to fix driveway cracks and other forms of damage on Dallas structures using other processes, too. One popular procedure contractors utilize entails applying a flexible vinyl sealant in driveway cracks in order to mend them. The sealant is simply placed inside the crevices. It’s generally used if the driveway problem isn’t badly damaged. If you have a cracked driveway, contact HD. We can accurately figure repair costs. What’s more, we know how to deal with all forms of damage, including fractures. 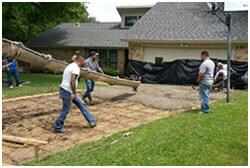 We’re contractors that solve driveway problems in all Dallas areas. So schedule a free driveway repair estimate online if you need driveway resurfacing, paving or other services. We perform thorough evaluations all across the DFW metroplex and have five locations to serve you.